A tasty mix of mellow and funky rock with ultra-smooth vocals, dirty guitar, and a life's soundtrack of lyrics. Truly appealing to all ages. 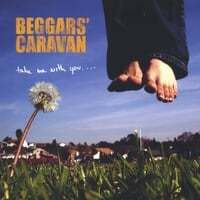 Since officially forming in Durham, NC, Beggars' Caravan rolled into the indie rock scene in 1999 with highly distributed copies of their self-titled demo along with various fan recordings of their earliest live shows. Singer/songwriter Chris Barkley and guitarist/songwriter Kevin Thornton began blending their sorted musical backgrounds in college, both already drawing on professional training with various instruments as well as experience performing both nationally and internationally. They soon would be joined by Brandon Allen on percussion, whose extensive experience and unique rhythmic playing style intertwined with bassist Paul Benner’s keen sense of groove established a mighty foundation to the rootsy, home-grown melodic rock that has become the trademark Caravan sound. The band's first studio album, Take Me With You, finds the group performing at a creative peak- with unforgettable melodies and inspired lyrics that bring the musical prowess of its members and a few special guests to the forefront. The album instantly captures the listener and carries you blissfully along life’s familiar roads; from the intimate to the raucous to the irreverent, influences such as Tom Petty, Nick Drake, Wilco, Steve Miller, and the Allman Brothers wind their way into a beautiful musical ride. With their always crowd-pleasing live performances and with standout tracks like "More Like Ewe" and “Right Where I Belong” soon to be dominating radio airwaves far and wide, Beggars' Caravan is an essential addition to any music lover’s library. I can't stop listening to this music. These guys are gong places! Great music. Cannot get enough. Everyone needs a copy of this CD! These guys are great!! Saw them perform live and they were magnificent and so much fun!! Great band, great music!! I am a huge fan!! What a great CD! I cannot get enough of it! AWESOME!